Site SF-88 museum contents have been mostly removed. Ride the missile elevator down. Click here to expand, 56 K bytes This is a map of the Golden Gate area of San Francisco. The site is north of the city and the Golden Gate bridge. This is the front gate of the assembly and launch area (the only accessible area). It is just 100 meters up the road from the Park Visitor's Center. All of the displays are in this area - even though in real life, the radars had been on the top of a nearby hill. We are through the front gate, looking back over the missile assembly area. You can see various buildings. Its Saturday, and a group is working on the engine of the wrecker. 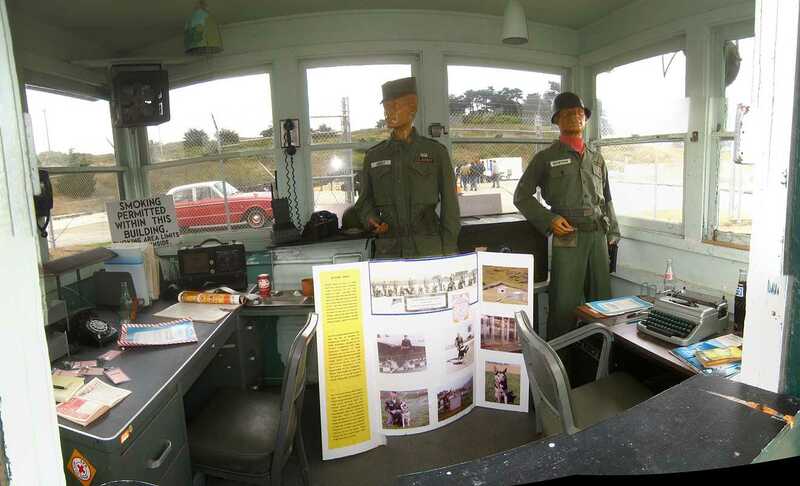 This guard shack is a center of guarding the launcher magazine area with its "interesting" war heads. We see two Nike Hercules missiles on rails. The missiles were moved in this position along the rails to launchers that could lift them to a vertical position for launching. The open doors lead down a stair way to the underground missile storage area, usually called "magazine". The low yellow structure is the top of the missile elevator that lifts the missiles from the underground missile storage area to the rails and launchers. The radars and the battery control were actually on the top of the hill in the background. We cannot drive to the top of the hill, so the displays of the radars, "battery control van" and "radar van" are in the missile assembly area near this launcher area. This Nike Hercules missile is in the underground storage area, magazine, on the elevator. The yellow and black striped area is (one half of) the elevator door. The missile is actually belly down, it flies in this attitude. The missile itself is white, the booster is green. The little fins in front of the big fins house the missile antennas which listen for the Missile Tracking Radar commands and echo back a radar pulse for easier tracking. There is a launcher mounted on the elevator (very hard to see in the shadows). Missiles can be fired from this launcher as well as 3 other launchers on the surface. You can see the aft section of the white missile, and the green painted booster cluster. The elevator doors (diagonal stripes) were always closed for launching. The green iron work to the left and right are racks leading to other launchers. The missile could be moved along these "rails" to the other launchers. This is a missile on a trailer. In a fixed situation, such as SF-88 and most continental U.S. sites, the trailers were not present. This shows the structure of the launcher elevating mechanism. This is a fixed missile launcher. It can raise the missile to a near vertical position, and launch the missile . Another work "party". The launcher was raised to a vertical position for the first time in 23 years. It raised and lowered 9 times, then something went wrong! It has now been wrong for 2 weeks, and ... . Success! After 23 years, missiles can be erected and lowered at SF-88. This will be the only U.S. site, due to treaty limitations, that will be allowed to erect Nike missiles. This radio controlled aircraft was the target aircraft for most annual test firings for site personel. In the "lower 48" site personel were transported to Red Canyon (for Nike Ajax test firing) and to McGregor range for Nike Hercules test firing. For research and product test firings, jet aircraft and rockets (Corporal ballistic missiles or Nike Hercules missiles) were also used for targets. 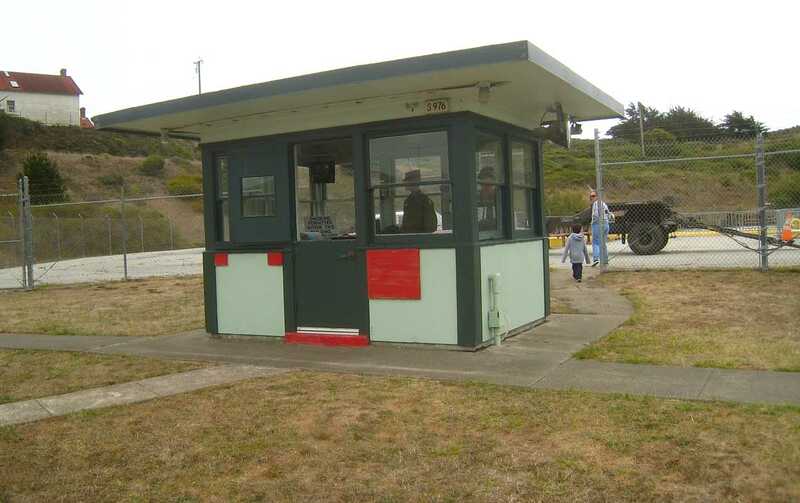 This is the basic acquisition radar, the only acquisition radar for the original Nike Ajax, and the lower power supplemental radar for the later Nike Hercules sites. This is where the battery commander sat. This version of Nike had 2 big radar scopes. These scopes displayed data from the "acquisition" radars that went round and round. One for the HIPAR (more powerful longer range radar) and one for the LOPAR (a less powerful, shorter range radar). The acquisition radar operator sat in one of these two chairs. This is one of 2 racks of "operational amplifiers" used in the Nike analog computer, each group of 5 tubes is 2 operational amplifiers. This is the servo cabinet. All precision multiplying and dividing by variables were done by potentiometers here. Computer test modes, computer test problems, radar offsets, and power supply status were also controlled or viewed here. After looking at the complexity (and therefore expense) of the 1950s analog computer you can begin to appreciate why the much lighter and cheaper digital computer was welcomed in the 1970s. The 4 large cabinets of the analog computer were basically turned into storage closets, with a small part of one of the cabinets containing a militarized (tougher) DEC PDP-11 digital computer. The actual Integrated Fire Control (IFC) area for this site is at the top of Wolf Ridge to the west, and is abandoned. Among many other problems, part of the road to this site slumped about 40 feet during the 1989 earthquake. This is a view facing west over the Pacific Ocean. The view is from the front gate of the abandoned Integrated Fire Control (IFC) area at the top of Wolf Ridge. This is a view facing east into the abandoned Integrated Fire Control (IFC) area at the top of Wolf Ridge. This is a view from the 10 foot high target-tracking radar platform. This is a drawing of a "HIPAR" radar used by the Nike system.